The QIPCO Sussex Stakes was billed beforehand as ‘the Duel on the Downs’ and the Group 1 contest did not disappoint as Toronado finished with a wet-sail to beat his big rival Dawn Approach by half a length. Toronado, who received a big cheer from the crowd, had lost out to Dawn Approach in both the QIPCO 2000 Guineas and St James’s Palace Stakes and winning training Richard Hannon was pleased to set the record straight. “I’d say they are two top-class horses,” said Hannon. “I told Hughesie to drop in, it was the only thing he could do from that draw. I didn’t want him to catch the pacemakers coming back. “It was looking difficult two furlongs out but our horse has a hell of a turn of foot. “Hughesie rode him at home four or five days ago and said he was the best he’d ever ridden, even better than Canford Cliffs, who was a very good work horse. Looking to the future, Hannon’s son and assistant Richard added: “We’ll see how he comes out of this but the Jacques Le Marois and the Queen Elizabeth II Stakes are the obvious races. 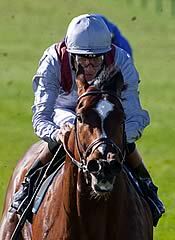 Jockey Richard Hughes added: “He’s proved he’s a brilliant horse. My plan was ‘wide, fast and late’ and luckily it worked. I didn’t want to get into a battle with Dawn Approach so I wanted to get there late and fast. “They went a good gallop and we saw two wonderful horses, I’m just glad our’s was the most wonderful horse. It’s very sweet. “I felt he had come on a little bit at home mentally and he was a more mature horse. 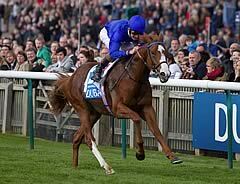 Jim Bolger, trainer of Dawn Approach, commented: “It was a top performance. We were just beaten by a better horse on the day.